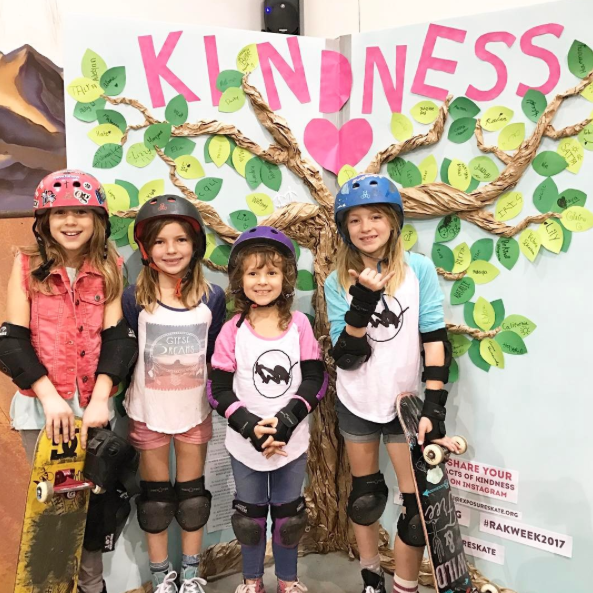 Skate Rising Phoenix started when Mary, the mother of skatergirl Rylie saw the Skate Rising events in the San Diego area & she knew she wanted to have events like it in her area. Originally from Pennsylvania, Mary’s been living in Phoenix for almost 14 years. Mary got involved with skateboarding when her daughter Rylie started skating. That’s how I met them. 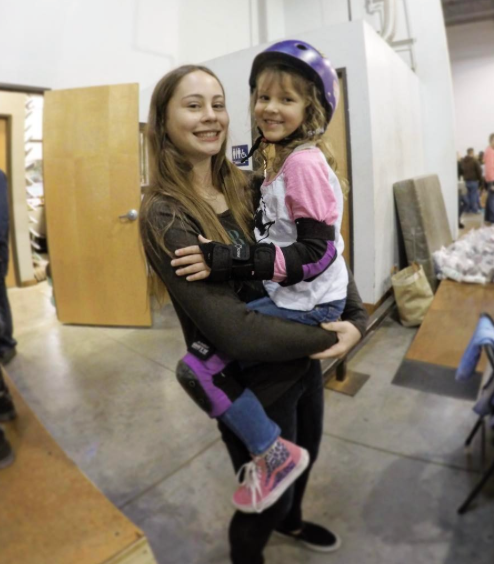 Mary reached out to Calli, who started Skate Rising – EXPOSURE Skate’s youth program, and worked with 91 West Skate Park to have an event in January 2017. 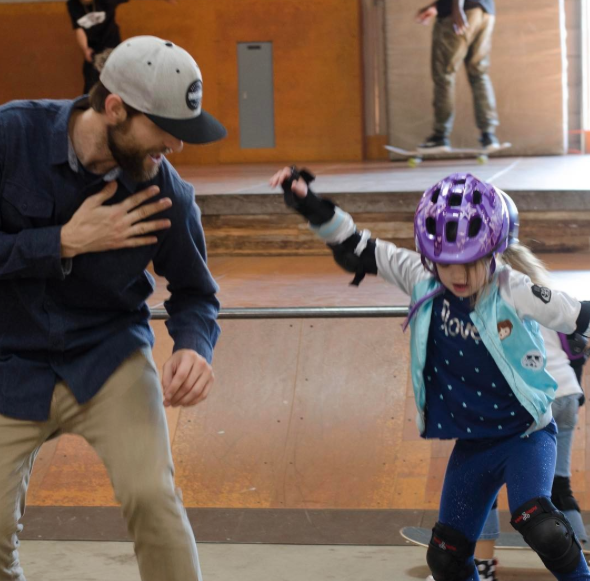 Mary loved the event so much that she’s now continuing to volunteer her time & skills to make it a monthly event on the third weekend of the month at 91 West Skate Par from 10am – noon. I had the chance to ask Mary some questions and get her recap on the February event. 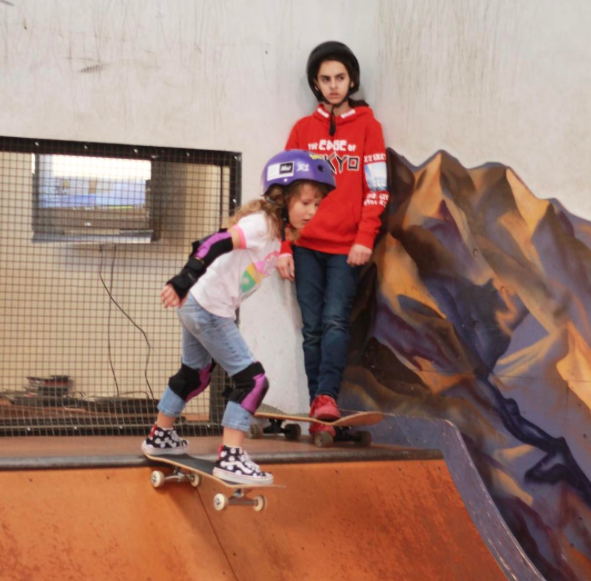 Why do you think skateboarding is good for girls? Is that why you encourage your daughter & other girls to skate? 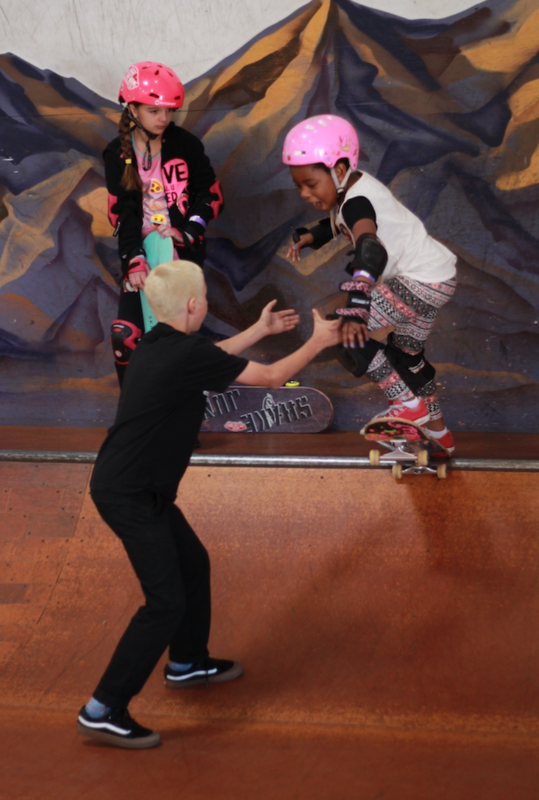 Mary: Skateboarding has been a HUGE confidence builder for my daughter. When she first started going to the skatepark I couldn’t get her to say a word to anyone. She was timid, nervous and unsure of herself. After only 5 months she now has older girls who are like sisters to her. They mentor her and inspire her to push herself. They support her when she falls down and cheer her on when she does something good. She’s learning that behavior and putting it toward encouraging girls younger than her. The biggest lesson I think she has learned is that you can fall, get back up and try again. We have a lot less drama over something as small as a hang nail now. She’s becoming stronger every month and has the mindset that she can do anything if she puts her mind to it. What did you love about the Skate Rising event that made you want to share it? Mary: In one word EVERYTHING. Haha. But really, I’ve been trying to teach my daughter the importance of giving back since she was very young. It’s hard with younger kids because a lot of the shelters and organizations that need volunteers don’t allow kids under a certain age. Thinking back to when I was young skateboarders got a bad rap. To see how the sport has evolved and see all the good that is happening in skateboarding, I really wanted to be a part of it. 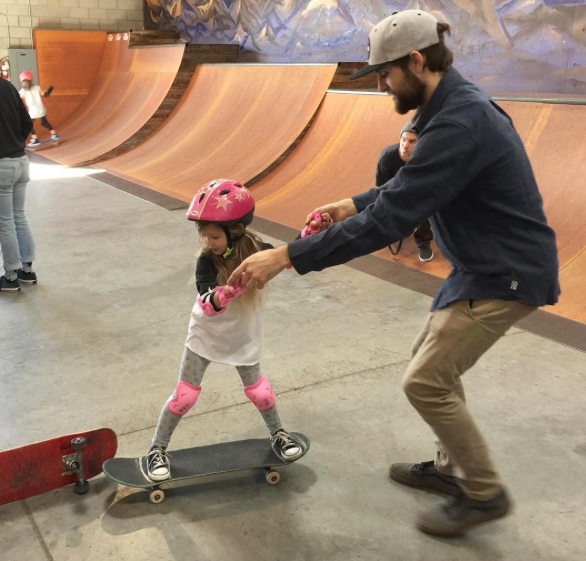 I want to show other parents that skateboarding is an incredible sport for girls and can be safe and fun when you find the right group to do it with. So far the parents have been really impressed with the skaters who volunteer their time. They are amazed at their patience with the girls and how they are able to make even the most nervous girls feel comfortable on their boards. We’ve had coaches who take time off of their jobs to come out and skate with us, which I have a lot of respect for. It shows they care about the future of skateboarding. Did the January event get new girls interested in skateboarding? 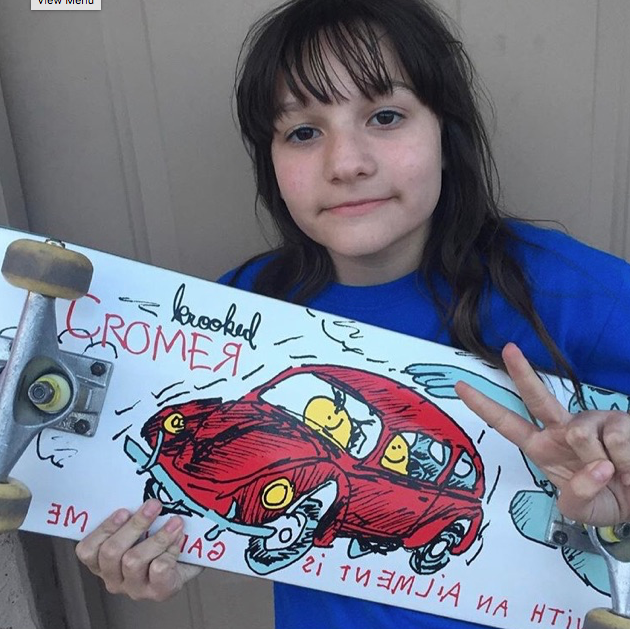 Way back when Calling all the Skater Girls in Mesa Arizona I wrote this post about a girl who wanted more girls to skateboard in Arizona so I hope more girls are skateboarding in Arizona! Mary: Absolutely! I know of 2-3 girls who had never stepped foot on a board before now asking for boards for their birthdays. I’ve seen 2-3 new girls taking trial lessons each week and even coming out to our Girl’s Night open skate session at 91 West. 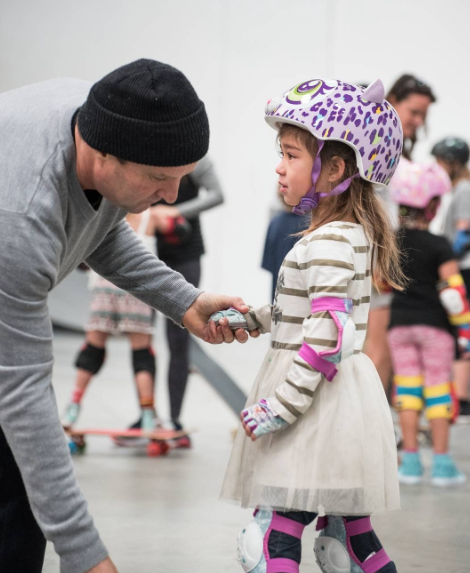 I think it would be hard to grow the girl skate scene without an event like Skate Rising. It’s just not a sport most parents think to involve their daughters in and many don’t realize it is something you can take a class in. I think especially for parent’s of girls, particularly dads, it’s a bit intimidating walking into the unknown. The first time I walked into 91 West I was terrified. Had I started her at an event like Skate Rising surrounded by more girls, I think I would have felt much more comfortable. I hope this gives those parents of of those more daring and adventurous girls the comfort they need to allow them to try something new. What was the response you got from participants at the January event? Mary: The girls who were already skating were so grateful that Exposure allowed us to bring this program to Phoenix. They love seeing new girls skating and making new friends. It’s an incredible group of girls we have at the park. From what I hear, the new girls who have come to Skate Rising go home wanting to live on wheels, even if it means putting on a pair of roller skates if they don’t have a board. I’ve heard nothing but positive feedback from both parents and kids. If someone (or organization) wants to be involved with Skate Rising Phoenix do they contact you? Are the Skate Rising events at 91 West Skate Park in addition to the Wednesday Lady Nights? Mary: Yes! 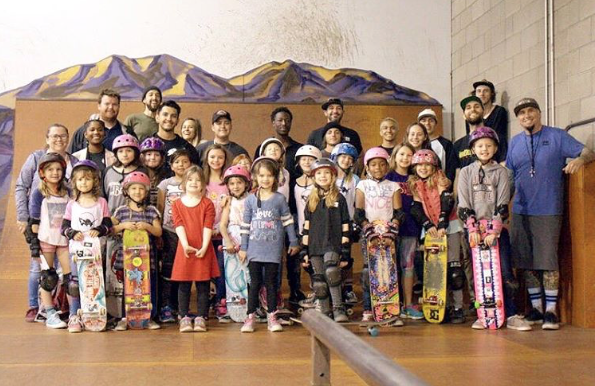 Before we started Skate Rising here in Phoenix we started $5 Ladies Nights to try to inspire other girls to skate. 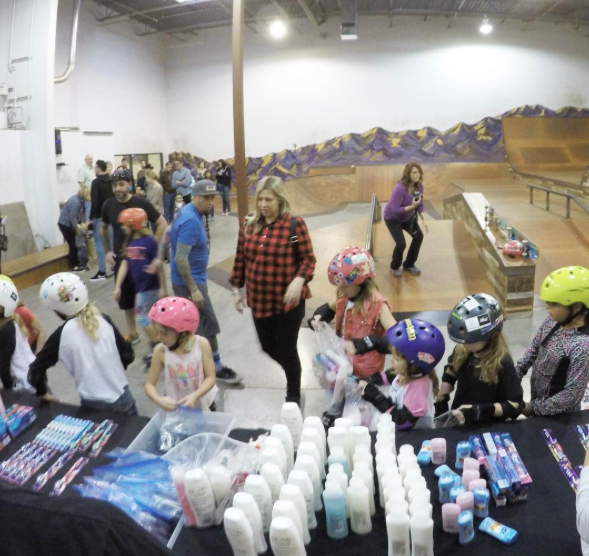 Now we use it to drive even more girls to our monthly Skate Rising events and we’ve seen many girls come out from our first Skate Rising event to join us on Ladies Night. What happened at the February event? It was a rainy morning, but we still got 20 girls out to the event, 11 who had not attended last month. Our topic was spreading kindness and how one act of kindness can make someone’s day, no matter how small it is. 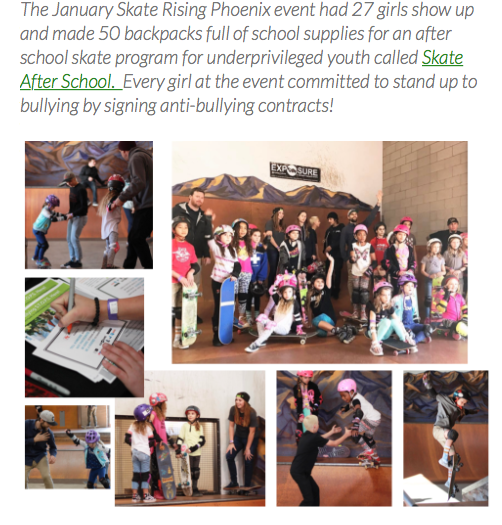 We encouraged the girls to go out and do an act of kindness this month and share it on social media to get their name in a drawing for a new skateboard from Sunset Skateboards with a set of light up wheels. After our talk they wrote their names on leaves to add to our kindness tree to demonstrate how kindness grows. We had so many generous donors this month who helped us to buy shampoo, conditioner, deodorant, soap and toothbrushes and toothpaste for the Women at the Phoenix Dream Center. The girls packed hygiene kits which included leggings from Ndulge and a meaningful Living Locket from Origami Owl with a flower charm and a love charm to lift their spirits. The kits will be delivered within the next week to women at Phoenix Dream Center which houses people who are getting back on their feet after different life altering situations. Thank you Mary for updating us on what happened and for getting these quotes from girls who attended. Be sure to follow Skate Rising on IG for all the latest updates on upcoming events. Where are you having fun skating & who are you sharing skating with? Hope you share soon because more girls do skate when they see girls having fun skating & getting encouragement.